Amrita SeRVe, which promotes the vast Indian cultural heritage, is revitalizing forgotten local art forms in the villages by supporting and arranging accessible classes. Two months ago, twenty 8 – 15 year-old girls of Nandi Kovil embarked upon a dance adventure sure to imbue in them a vital part of this heritage. The Bharatanatyam, an ancient female dance that formerly took place in the temples of Tamil Nadu, is a traditional expression of scriptural stories and spiritual ideas. 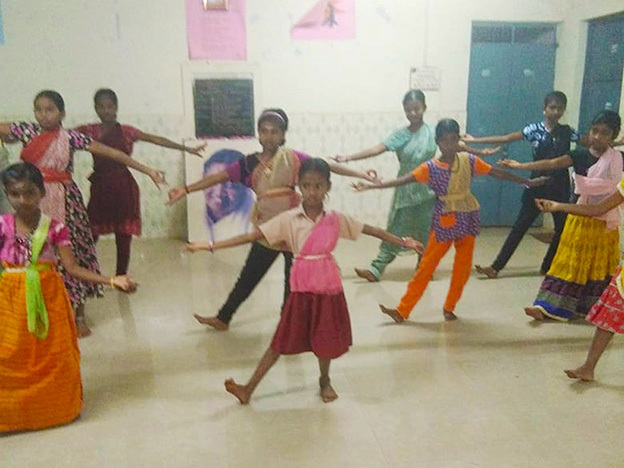 Ambika, a nurse at the Ettimadai campus of Amrita Vishwa Vidyapeetham in Coimbatore, learned this dance from her teacher and now arranges time in the midst of her tight schedule to teach it to these young girls in the traditional manner, from teacher to student. Bharata Natyam is an art which consecrates the body . . . The dancer, who dissolves her identity in rhythm and music, makes her body an instrument, at least for the duration of the dance, for the experience and expression of the spirit. The traditional order of a Bharata Natyam recital viz. alarippu, jatiswaram, varnam, padams, tillana and the shloka is the correct sequence in the practice of this art, which is an artistic Yoga for revealing the spiritual through the corporeal. The two-hour-long session begins with an invocation, Alaripu, to seek blessings consisting of hand gestures, mudras, steps, and prostration directed to the Divine and the Guru. For beginner dancers, foot work along with mudra practice is essential, for the story is told through physical movement accompanied by music. Young dancers gradually learn not only the foot movements, but facial gestures, too. Following the foot work and mudra exercises, slokas, scriptural rhymes, are chanted. Since Bharatanatyam originated as an expression of scriptural stories, Ambika dedicates the third hour to explaining the meaning behind the slokas and the stories. Fascinated by the cultural dance tradition, the girls are deeply committed to the weekly practice, as are their mothers, who are grateful their daughter have an opportunity to learn such a sublime art performance. *Bharatanatyam is over a 2000 year-old tradition in Tamil Nadu and was performed by female temple dancers, devadasis. The dance is a team performance of solo dancer, groups of dancers and Carnatic musicians to express the underlying text. Communication of the text happens through the footwork in accordance with the rhythm, body language, postures, musical notes and the tones of the singer. Also, aesthetics and costumes have their part in the performance. At least 20 yoga asanas are used in the dance, and several back arching and standing poses can be found in the movements.